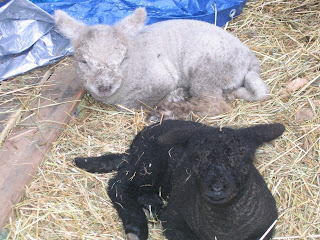 Here are the lambs at two weeks of age. They are so big and healthy. Today they had their tails done and their first vaccines. They are not to happy with us right now. Soon after the bands were put on their tails they began to run around and drop to the ground like they are having a seizure, then run to mom for some milk and comfort. It hurts for a short time but it really must be done for sanitary purposes.